what's OLD is NEW again!!!! it's been several weeks now since i started on Crystal's shawl and i'm making slow progress ... two stitches forward, 10 rows ripped back! i initially started out with a softer, DK weight yarn and discovered i don't like garter stitch at that weight, with those needles. Although i had invested a good amount of time into trying to convince myself otherwise, i simply had to say it out loud ... 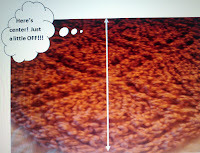 I DON'T LIKE GARTER STITCH! (so, i scrapped that creative option and ALL those cute medallions i had crocheted for inserts and edging) ... ripped it all out and rolled it back into a cute little ball, waiting for the next inspiration to hit! 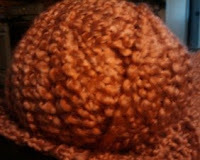 ... i trudged onward to the next pattern and found some warm, soft Homespun that was GOING TO BE IT!!! i could feel it my bones AND my needles, found an awesome pattern and hit the road! About 18 rows into it i made a mistake in reading the pattern, but surely noone but ME would notice, so i just kept knitting .... and trying NOT to look back at row 18 ...... i'm now on row 100, so close to the end ... but i'm still looking down at row 18 and that spot is just GLARING .... . ,,,,really, it's okay, i can just bind off and it will be okay ... or NOT!!!! so, while on the way to taking our daughter back to college for another semester i ripped out 100+ rows all because i refused to make the necessary adjustments BACK ON ROW 18!!!!!!!! and hopefully a hug for Crystal in the not so distant future!